Designing a bathroom involves numerous considerations. We have put together these design tips and ideas which we believe you should keep in mind when planning your dream bathroom! Discover the best layouts, bath features and effective storage solutions. 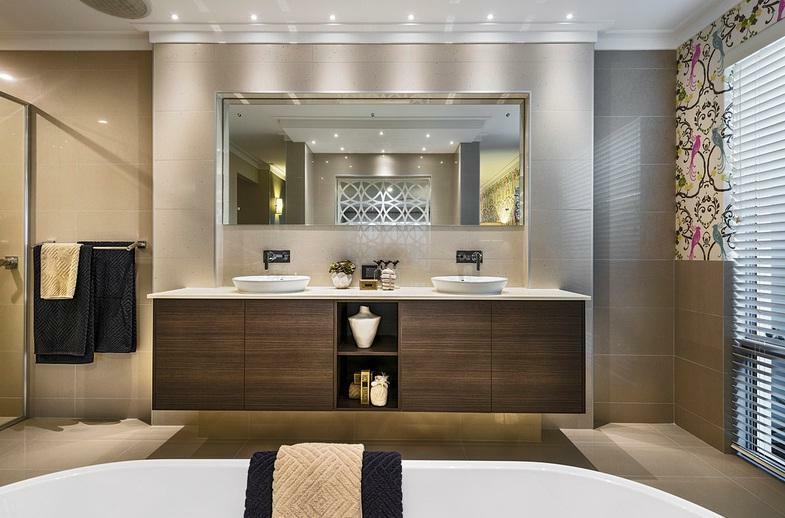 When designing your bathroom layout you will need to consider the position and the size of the vanity. The vanity must be large enough to cater for your needs, there must be enough space to move around the bathroom and swinging doors must not not interfere with the vanity. If you have a small bathroom or if you like an open space, a floating vanity can visually expand the appearance of your bathroom. Floating vanities are often required if your bathroom has in-floor heating. If you are renovating your bathroom, it is recommended to position your vanity in accordance with the rest of the plumbing in your bathroom otherwise you will need to pay extra to have the plumbing diverted. Depending on the size of your bathroom and your personal needs, you can choose from a host of options whether it be a double-sink vanity, a wall mounted cabinet or storage shelves. When selecting your cabinetry it is important to incorporate form and function into the theme you want to make – for example traditional, modern, retro or vintage etc. Much like kitchen cabinets, you can purchase bathroom cabinetry in stock units or you can cabinet’s custom designed and built. Depending on your budget, stock units are typically least expensive and custom designed and built the most expensive. When choosing the material of your cabinetry it is important to select products that are water resistant and heat resistant to ensure longevity of the cabinetry. These days, bathroom storage is considered number one when designing a bathroom. Cupboards and/or draws below the vanity provide the majority of bathroom storage. In addition, shaving cabinets at eye level on either sides of the mirror are ideal for additional storage. If you require further storage, you can create a storage wall that runs the whole length of the bathroom and if possible, create a lower cabinet for the kids. Consider building an open-concept shower that does not required a door or curtains, this will allow the bathroom to appear spacious. It is particularly important to ensure sufficient drainage in the shower if there is no shower door or curtain. An inbuilt shelf in the shower wall is a great way to store products rather then on the floor of the shower. In addition, a shower head mounted to the roof or high on the shower wall will prevent water from splashing outside the shower. If your bathroom is large enough to include a bathtub, you can use this as a feature point of the bathroom. Freestanding bathtubs are ideal if you do not have a very large bathroom or if you want to position the bath in the centre of the room. Freestanding bathtubs can be mounted onto the floor, rest on a pedestal base or on claw-and-bull feet. On the other hand, you may choose an inbuilt bathtub whereby the bath is built into a box like structure. If you choose this option, you may decide to use a feature material on the surroundings of the bath to make it the feature of the bathroom. When designing the bathroom, toilet placement is very important as the toilet must not only pass regulations but must also be comfortable for the users. The toilet should always be out of view from people sitting in dining areas, kitchens or living rooms. If you have a relatively small bathroom, it is important to make sure that the swing of the door when entering the bathroom does not interfere with the location of the toilet. If the swinging door does interfere, consider installing a sliding door. Alternatively, you may consider having the toilet in its own compartment. The removal of odour must also be considered when designing the toilet. Placing a vent fan in the ceiling, in the centre of the bathroom or the toilet compartment is the most effective method to remove odour. Alternatively, small high windows above the toilet are another option. Ceramic, stone tiles and marble are all durable and water resistant flooring choices. When selecting specific tiles, choose tiles that are matt in finish, not too dark, not too light and have a grain in them to prevent the appearance of dust and dirt. If you decide to use tiles on your bathroom floor, ensure grout is kept to a minimal to prevent dirt getting trapped in between the tiles as this can cause discolouration. If your bathroom presents a cold, hard feeling consider sealed hardwood floors as they can add natural warmth to the bathroom. In simple terms – light, bright bathrooms are warmer and more inviting. When designing a bathroom, ensure you position windows to maximise the exposure of daylight throughout the bathroom, in particular on the vanity. In addition to natural lighting, wall-mount lights at either side of the mirror will illuminate your face and prevent shadows. Ceiling mounted lights or down lights can be used to provide additional lighting and showers will require enclosed vapour-proof down lights. As bathrooms are considered ‘wet areas’ is it essential that fresh air is circulating throughout bathroom at all times. When designing your bathroom, ensure you carefully consider the placement of windows to ensure that they will provide fresh airflow and sunlight. Essentially, bathroom windows should be able to stay open 24/7 without letting in rain or insects. If your bathroom requires additional ventilation, consider installing a ventilated sky light. A well-placed mirror running from wall to wall without visible fixings can instantly double the feeling of space in the bathroom. When fixing a mirror to a wall, it is critical to ensure the mirror is well sealed on the back to avoid any discolouration or deterioration around the edges. As bathrooms are often cold, hard places adding window treatments allows you to soften the appearance of the room. It is important that window treatments resist moisture and humidity while also allowing providing privacy and light. For this reason blinds, shades and shutters are the most viable options. For more information on designing your dream bathroom, contact us today on 1800 643 800 or complete the form below.